Missouri State University's College of Agriculture invites you to the MSU Ag Expo! 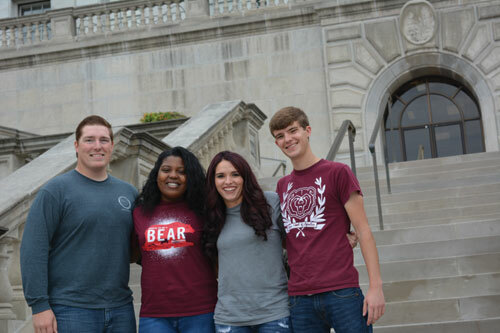 This is a day for high school juniors/seniors and community college students to visit Missouri State’s College of Agriculture. We want your students to know about the opportunities that await them here! The event includes tours, lunch, Missouri State T-shirts and more. Pre-registration of all students is appreciated but not required. Cost: $10 per person. Pay at check-in. Program time: 9:30 a.m. - 2 p.m.
No charge for advisors or parents. Additional students who respond after the deadline are still welcome. Contact the College of Agriculture if you have any questions. The College of Agriculture has twenty clubs and organizations in which you can become involved: Block and Bridle, Pre-Vet Club, Collegiate FFA, Agronomy Club, The Wildlife Society and agricultural fraternities and sororities, just to name a few! You also have the opportunity to join Agriculture Ambassadors and enroll in the Ag Leaders class. The leaders class allows you to be more involved in the workings of the College of Agriculture as well as hear speakers in the agricultural industry. These activities help you make new friendships with other students from across the state and also be closer to many helpful faculty members of the college. We encourage you to attend Ag Expo on November 16. Come learn about the exciting world of Missouri State Agriculture!